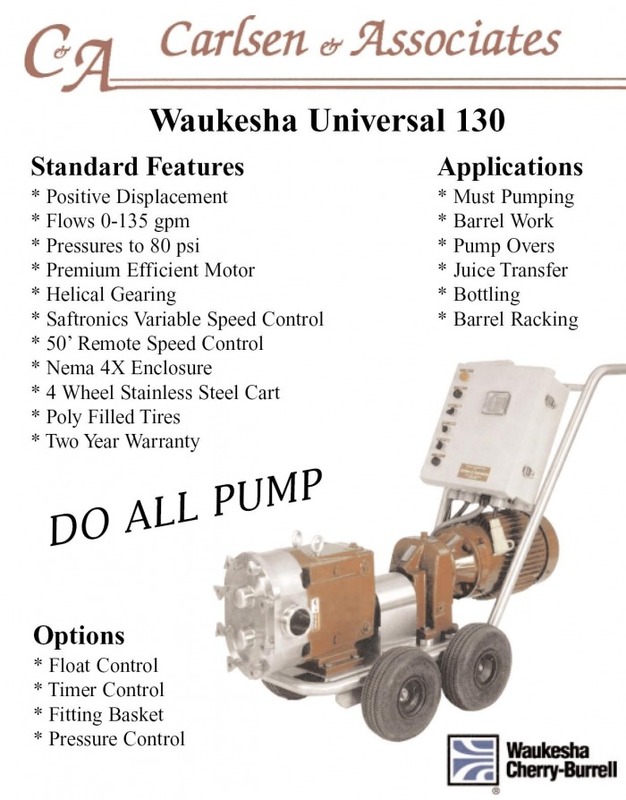 The Waukesha wine pump is a household name in food processing in our country. It remains the staple of the wine industry as this super- gentle, but strong, self- priming wine pump will not increase solids or vegetal characteristics in wine during must pumping or pumpovers. Still made in the U.S., the head and lobes of this pump, when added to a pile of Carlsen- specific parts add up to an unbeatable combination. You are looking at the strongest and gentlest wine pump and must pump in our industry. They are available in six sizes. It is self- priming and available to run on 220V Single phase, or 208/230v Three phase, or 480v three phase. Specify at time of order. Others may offer a Waukesha head on a cart for wine, but you will not find our warranty, support, service, or knowledge elsewhere. Yamada wine pumps for the winery represent a cost- effective, food grade, simple, easy to maintain pump which is great for barrel topping, transfers, some types of filtration, and pumping out a press pan. They run on compressed air; not electricity. Additionally, one neat feature of this wine pump design is that you can set its pressure output on the regulator on board at a level that will enable closing the downstream valve without having to yell at someone else to stop the pump 100 feet away. The only possible downside to having one of these wine pumps is the need for compressed air. You probably need an air compressor anyway, so that's not the end of the world. 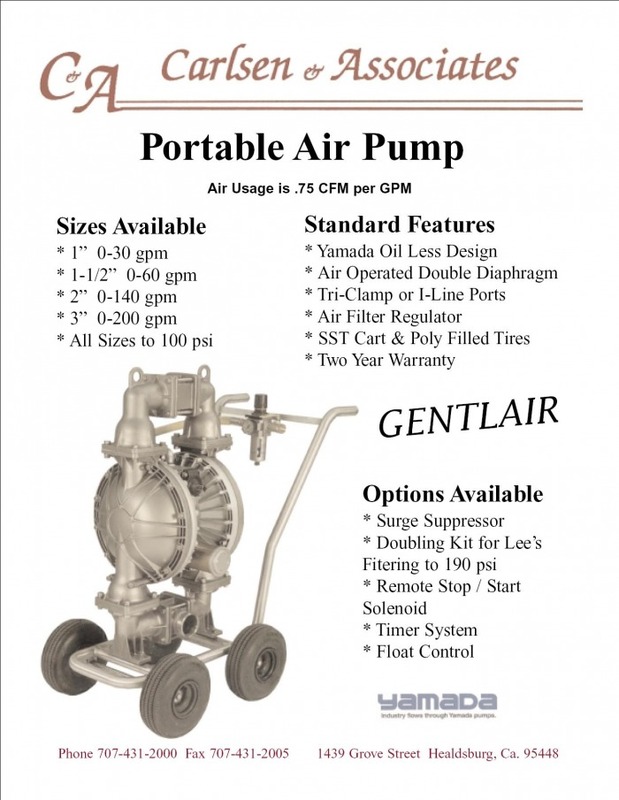 Yamada wine pump owners enjoy its light weight, portability, functionality, and low risk of blowing up a hose. Centrifugal Pumps are loved by brewers and winemakers alike. 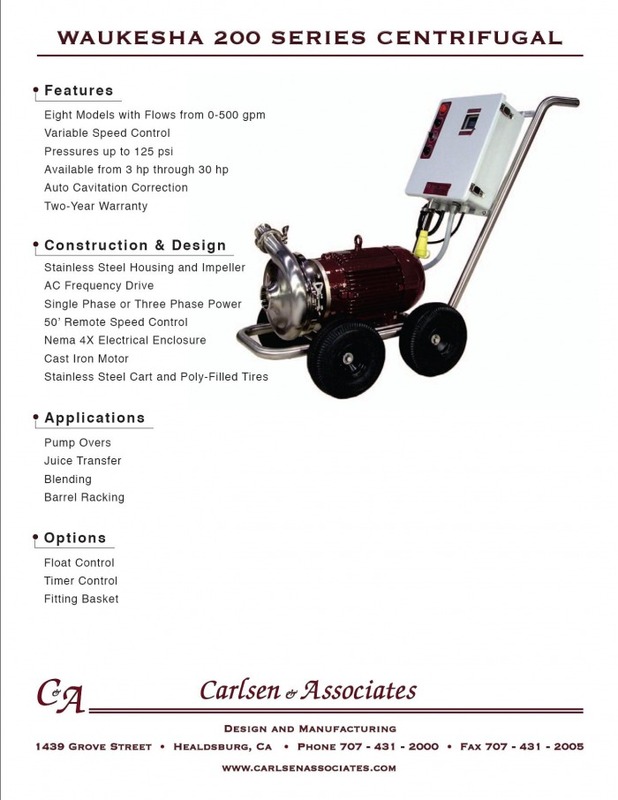 Our cost effective, Centrifugal wine pumps are also from Waukesha and feature the same great service and support as everything else from Carlsen. Popularized by west- coasters doing pumpovers, these are a unique type of wine pump which could be used as your winery's second pump. We offer them in several sizes, horsepower ratings, and voltage types. 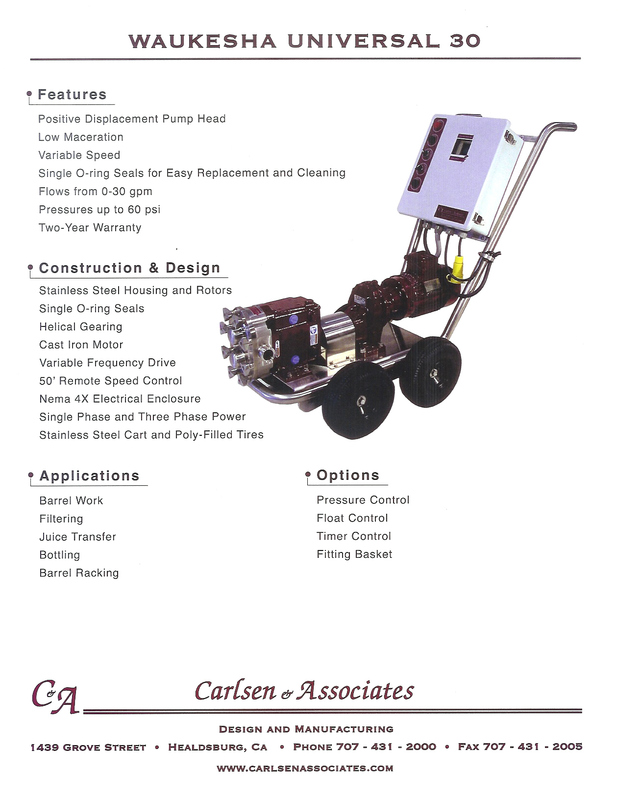 Contact us to inquire about yours. Don't forget to check our free classifieds section where you can post your used winery pump or shop for used winery equipment.